Old map by ARROWSMITH - Cape of Good Hope. Title: Cape of Good Hope. Size: 18.8 x 28.0 inches. Colouring: In original o/l colours. Condition: In very good condition, many small tears to margins, some age toning. Decent margins. Irregular folds. 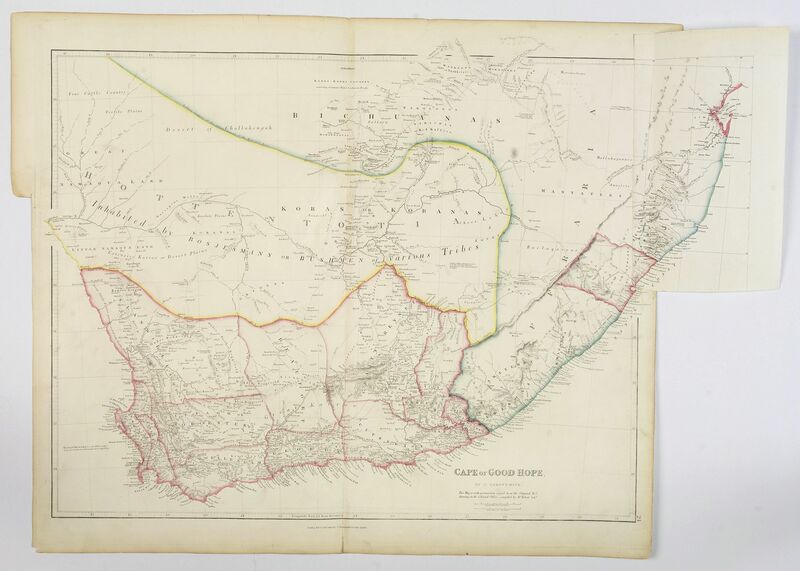 This map is possibly one of the most important maps of the region, published as it was during the Great Trek. The Great Trek was a movement of Dutch-speaking colonists up into the interior of southern Africa in search of land where they could establish their own homeland, independent of British rule. The map displays eleven magisterial districts and provides historically important documentation of travel and exploration in South Africa. Furthermore, the map shows the approximate location of indigenous groups, assigning a large area to the ‘Koras or Koranas’. Durban is shown in the Colony of Victoria. John Arrowsmith was one the nephews of the patriarch, Aaron Arrowsmith. He worked out of London, was one of the foremost cartographers of the era and, like his uncle, he aspired to design maps that were up to date Therefore this maps was regularly updated his maps. This map first was published in 1834, the example on sale was an update two years later, the map was so highly regarded that it was updated a further seven times to 1890. Arrowsmith's map is about 60cm x 50cm to which he added a small additional segment in the NE of the map (11cm x 23 cm). The map was both issued separately, some dissected and laid on linen, and also published in Arrowsmith's The London Atlas of Universal Geography.